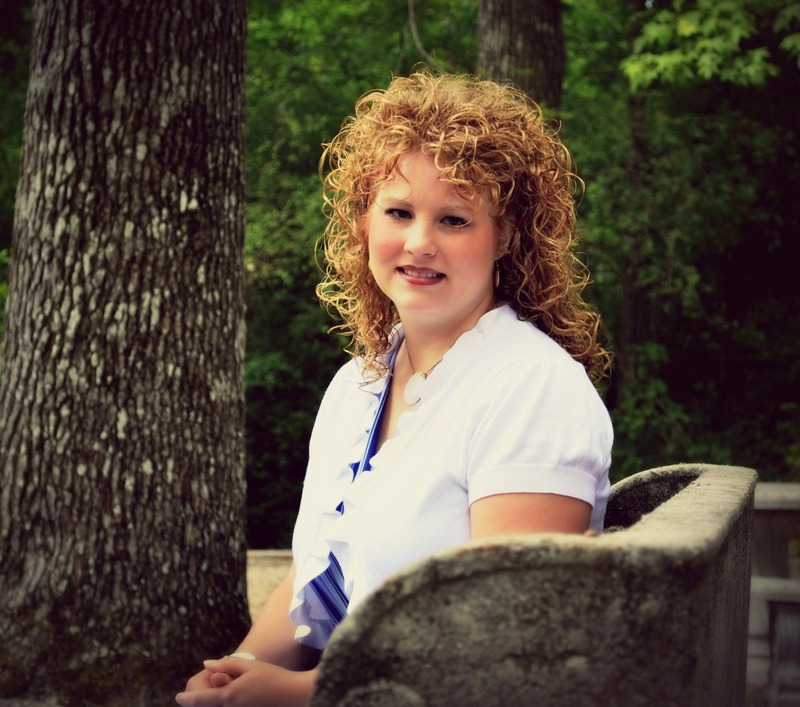 Can I admit to you that I struggle with cleaning, cleaning schedules, and keeping a clean house? Ok… can we all just admit that we struggle (unless you really don’t, in which case you can come give me lessons! ) I LOVE having a clean house but getting that way and KEEPING it that way has been always been a struggle. I have tried MANY different cleaning schedules (bathrooms on Monday, laundry on Tuesday, etc.) or doing the clean the house all in one day method, or the ignore it until I just cant take it method (that one really doesn’t work ). And nothing worked well for me, our home, our life, and my schedule. If I cleaned the house all in one day, not only did it take hours but it was messed up again by end of day and left me feeling discouraged. If I did one certain job on a scheduled day, what happens when that day is crazy and I am gone all day and can’t do it? Over the years I have read several books, blogs, and articles and watched my friend Molly (who is an amazing housekeeper) and honestly came to realization that it wasn’t a SCHEDULE that I needed but a ROUTINE. I started with doing one load of laundry from start to finish a day several years ago and that revolutionized the laundry problem. Sure I still sometimes end up with a basket to fold but there is no piles of dirty laundry and it honestly just works really well for me. So those are the areas I have mastered and I find myself doing without thinking about it. BUT, you may notice a big area missing on that list and it is FLOORS. I have a big, cumbersome vacuum cleaner which makes vacuuming a real chore. Plus we have 2 levels, carpeted stairs, a long-haired CAT, tile floors, and my little nieces and nephew are in and out of our home several days a week. Vacuuming once or twice a week just wasn’t cutting it. But I don’t have time every morning to drag the big, heavy vacuum out and spend 20-30 minutes vacuuming. I had been thinking that a smaller vacuum, especially one that would work good on hard floors as well as stairs would really help. 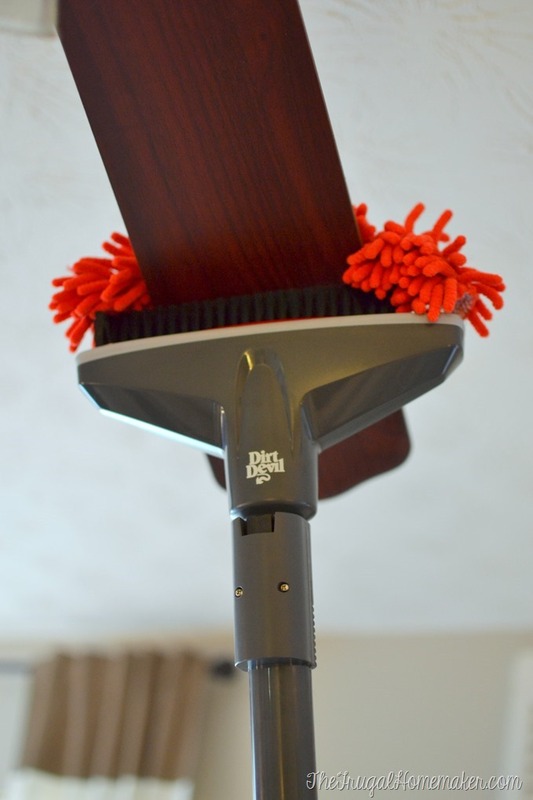 And this Dirt Devil® 360° Reach™ vacuum is the PERFECT solution! Have you seen this vacuum? It is AMAZING! First let’s mention the storage bag that keeps all the attachments, wands, and the cleaner itself neatly stored – love that! Then let’s talk about these amazing attachments. 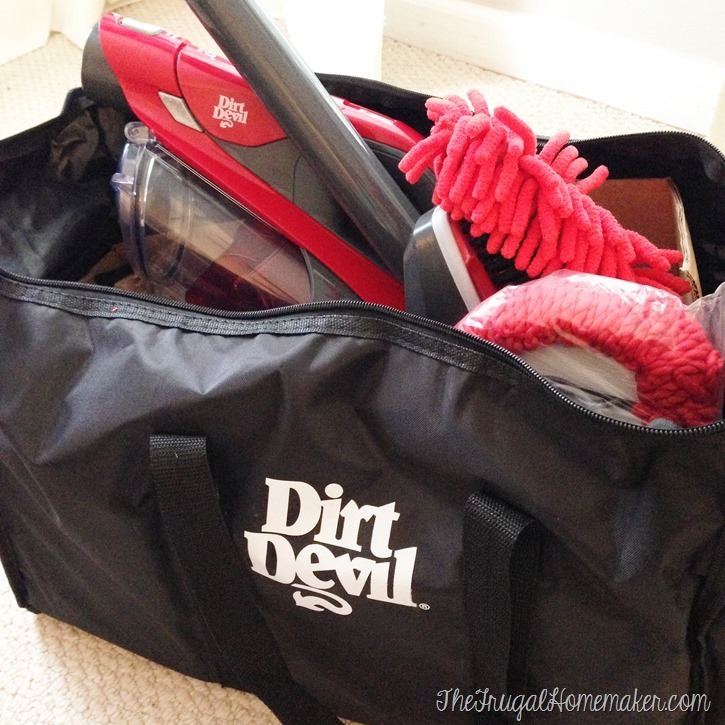 Seriously… if I sat down and made a list of all the attachments that I would want a vacuum to have, the Dirt Devil 360° Reach vacuum has them ALL! Washable cleaning pads, bag-less/easy empty canister, reusable quick-rinse filter, ability to switch attachments in a second, clean floors to ceiling and everything in between, long 27 foot cord, and it even has a CEILING FAN attachment… Yep, AMAZING! This is the Vac + Dust Above Floor tool with Swipe Microfiber Pad. It can be used to clean and dust baseboards, blinds, air ducts, shelving, and hard-to-reach areas. And the pad slips off and can be washed in the washing machine. 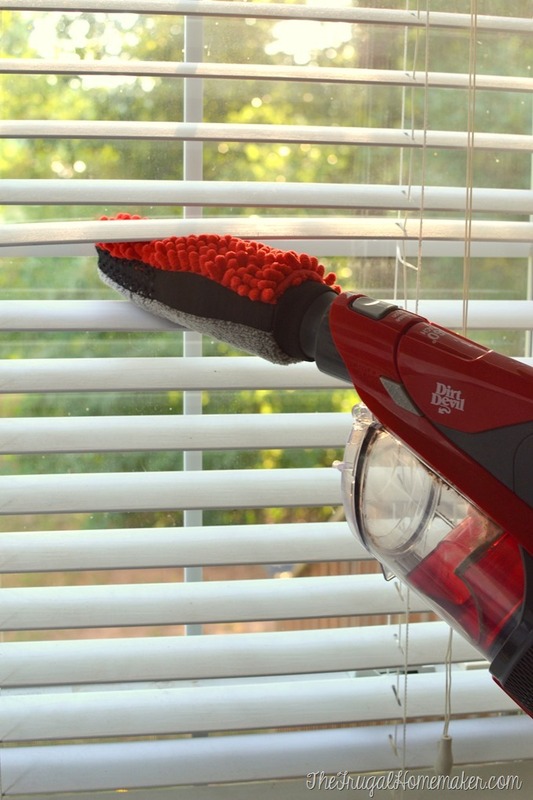 I was amazed at how easy it dusted the blinds – vacuuming up the dust instead of just brushing it back into the air. 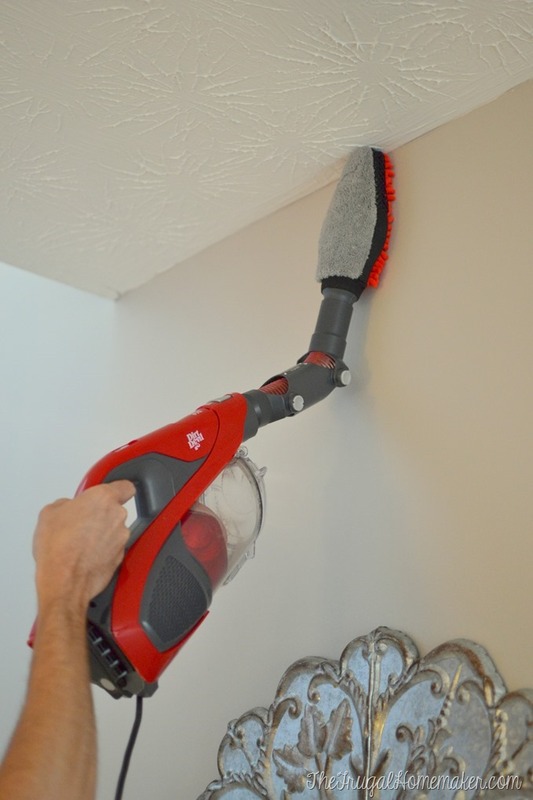 There is a pivot extension tool that can be used with several of the attachments so you can vacuum at an angle to do baseboards, along the ceiling, vents, and more. 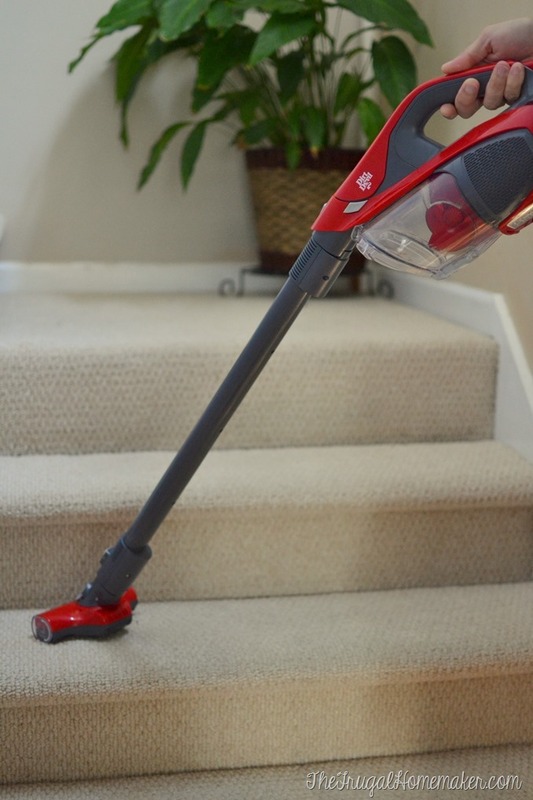 The Powered Stair and Upholstery Tool is great for cleaning my stairs! And honestly I can’t wait to try it out on my car floors too. Then there is the Powered Carpet Nozzle – it picked up so much dirt, hair, and dust! Even on areas that I thought looked clean, you could see stuff going into the clear canister. And this one – the Vac + Dust Hard Floor Tool with Swipes Washable Microfiber Pad – oh, I love this one! If you have kids you KNOW that all it takes is ONE meal and your clean floor looks like this. 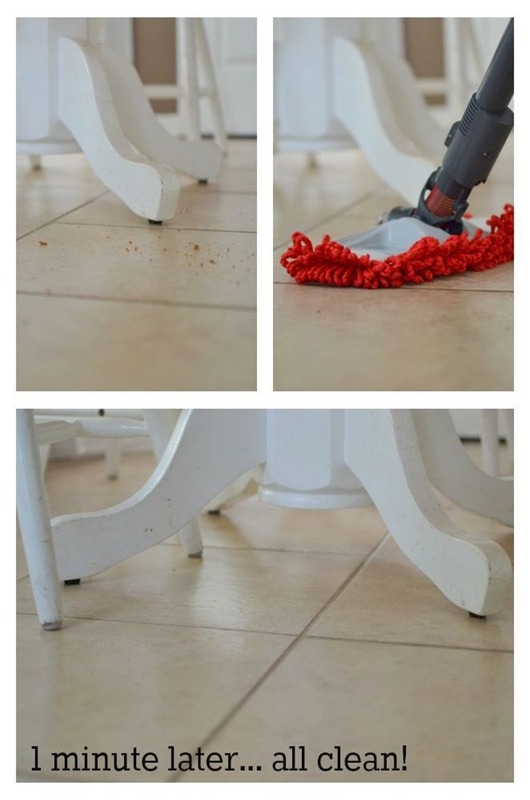 A quick swipe around with the hard floor attachment vacuums up the crumbs and catches all the cat hair and dust too. And I saved this one for last – the Ceiling Fan tool! It fits right over the fan blade and vacuums and dusts at once. Whoever invented this deserves a raise… seriously. It also has a crevice tool that stores in the back of the machine – perfect for vacuuming in the cracks of furniture, along baseboards, or in tight spaces. So now I am working on adding “quick vacuum of downstairs every evening” to my routine. So easy and quick – it has only been taking me about 5-8 minutes. And on the days I clean an upstairs bathrooms, I do a quick vacuum upstairs. I will still do my more extensive vacuum once a week along with mopping floors, but even that is not taking as long because my floors are so much cleaner! 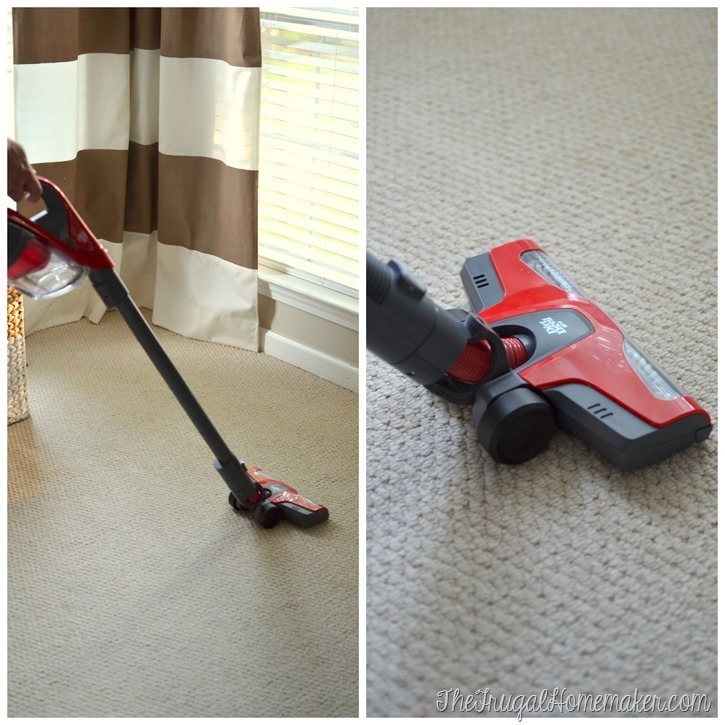 I truly really do love this vacuum cleaner and it has already made a difference in our home. The Dirt Devil 360 Reach vaccum is currently on sale for $149 and includes an additional attachment package valued at $75 (while supplies last). I would love to know your tips on keeping your house clean! 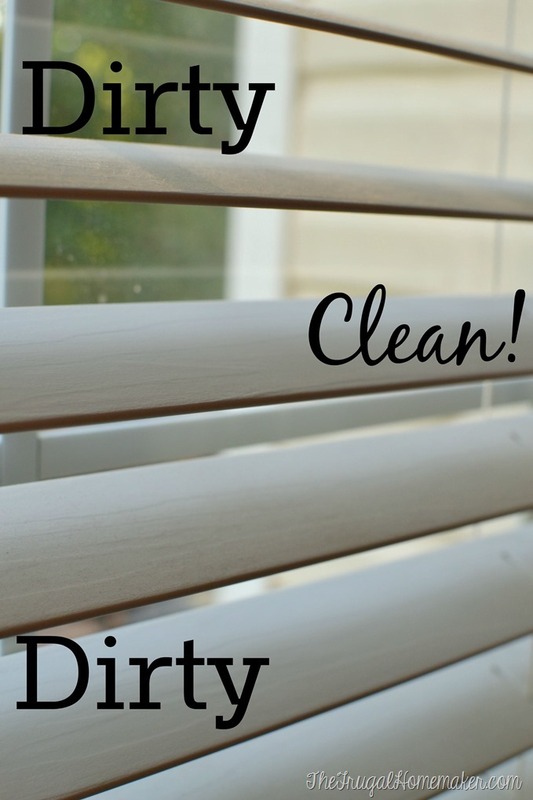 Do you use a cleaning schedule, do daily routines, vacuum every day? That Dirt Devil sweeper is the trick!!! I miss you older posts as well.. Some ads are ok. It just feels so impersonal now ?. 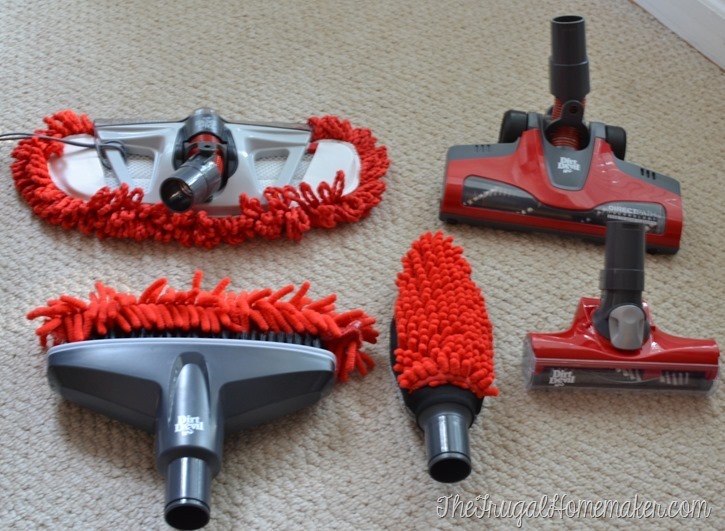 I am in love with this incredible vacuum cleaning machine! It has so many wonderful features and attachments! It looks so fun to use it and also very easy! 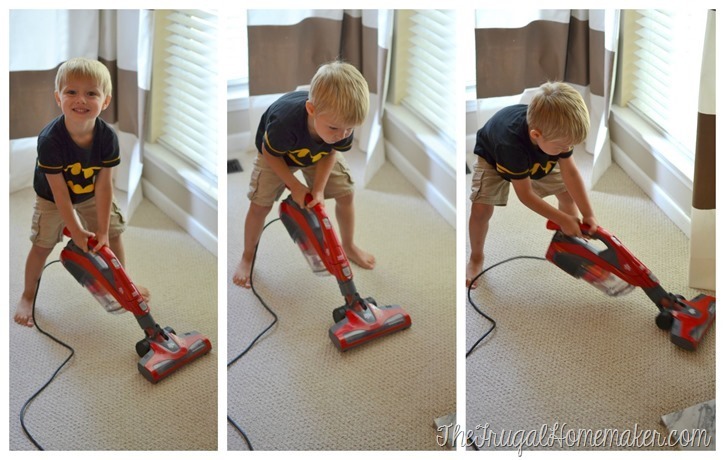 If I can make my kids to take part in house cleaning – I definitely want it! 🙂 Thank you for sharing! I am thinking of buying The Dirt Devil 360 Reach vaccum. $149 is a reasonable price for all of its remarkable features. I know exactly what you mean. Creating and following a cleaning schedule can be really hard when you already have so many additional responsibilities to tend to. This setup is really practical and seems like it’s working well for you. Nice job! Finding that ideal cleaning schedule can be difficult. Realizing that twice a week is not doing the job and also realizing that you can’t spare a half an hour each day is a difficult spot to be. It’s nice you found your ideal tool.